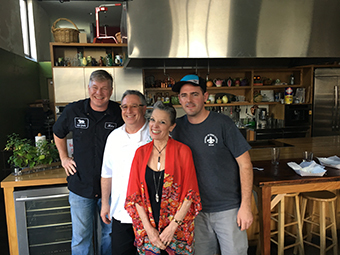 Host Poppy Tooker with Michael Brewer, Chris Montero and Justin Kennedy in the Sofab kitchen. In 2008, childhood buddies, Becker Hall and Rene Louape founded Hogs For the Cause during a casual backyard pig roast. Today, Hogs for the Cause has grown into New Orleans largest BBQ event, spanning two days with 85 teams from across the country competing for the big prize. But the real cause is pediatric brain cancer. Over the last decade Hogs has awarded 600 grants, partnering with Children’s Hospital of New Orleans, Oschner, Duke and many other children’s hospitals across the country to identify families in need. In this episode, we sit down with Becker to hear the story of how this worthwhile,now legendary event came to be and their plans for the future. And then we catch up with local favorites, Silence of the Hams, a Hogs team comprised of Chris Montero of the Napoleon House, Michael Brewer of Baton Rouge’s City Pork, Tory McPhail of Commander’s Palace, Jared Ralls and newest member, Parkway Bakery’s Justin Kennedy. To increase their annual giving to the Hogs Cause, chefs Chris Montero, Tory McPhail, Michael Brewer and Jared Rails developed a Louisiana style smoked sausage, produced by Chisesi Brothers. that’s now available at Rouse’s Markets and other groceries throughout the Gulf South. Don’t wait for the Big Hogs weekend, have a Louisiana Eats Quick Bite right now! To give to Hogs for the Cause click here.